Yammering on the internet is not hard work, in fact it is blindingly (and sometimes maddeningly when it is pointed in your direction) easy. Getting heard, and functionally interacting in a fashion that can contribute to the real focus and discussion, however, is hard. For my part, I often carp enough about the failings of big media that it is only right to give praise where due. Today credit is due to CNN’s Jake Tapper. Because he cares. Two nights ago, rightly or wrongly …. but I think rightly … I laid into CNN for their overbearing focus on repetitive, and somewhat mindless, continuing drivel on celebrity. That was, of course, in relation to Robin Williams’ death. A noteworthy, sad, and tragic event for sure, but there was only so much news, the rest was pure Entertainment Tonight like pathetic drivel. So I went after CNN, and I tacked Jake Tapper’s twitter handle on the end. I did so not because I thought he was the prime offender producing the overall CNN news product, but because I knew, from prior interaction, that Jake actually gives a damn and and is a contact point at CNN who would care. And maybe…maybe…be a change point. That was both fair, and unfair to him personally, at the same time. I am pretty sure both CNN and Jake were bombarded by by an untold number of missives of the same variety. I don’t how how other inflection points at CNN dealt with what was surely a lot of feedback, but the fact Mr. Tapper took the time to take umbrage, and discuss…and think…seems significant and admirable to me. And I admire that. I thought about writing this post long before I saw the following, but I was off with clients and court appearances, and could have easily shined it on, as I do with so many posts I want to write but don’t get to. Until I saw something from Mr. Jake Tapper today that was just awesome. Well, to be sure, this is the stuff even a critic of journalism can love and applaud. You know why? Because not only is solidarity with journalists under grand jury and governmental oppression admirable (I have some experience in GJ targeting), it is the only, and only proper, thing that can be done. There are not many out there to be so applauded. Maybe tomorrow there will be an issue, and moment of difference, on a different case. So it goes, and so be it. But, now, James Risen stands exposed and on his own. As a man, and as a journalist, Tapper stood up and gave public square to his voice. Good on him. Tonight, I am glad Jake Tapper is out there and is willing to engage. 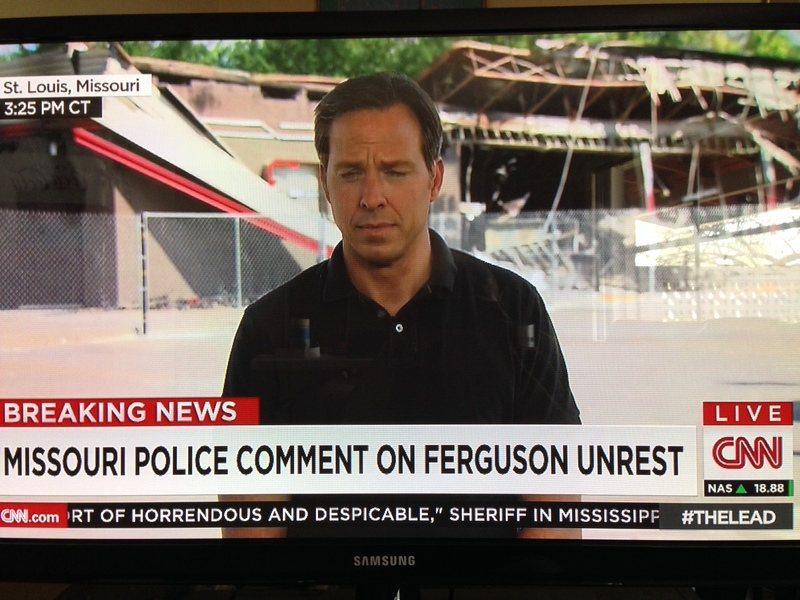 Tonight he did one hell of a report from Ferguson Missouri. Even if a big part was consumed by press conference feed. But, before and after, he made his voice clear. That is not exactly a common thing. It is to be commended. Give the man credit, he was there, and he cares. And I will buy him a drink. Wow. Just wow. Notwithstanding Mr. Tapper, you are a credit to the human race bmaz. ps, I ‘d buy you a drink too. And I DON’T mean a Michigan cult beer named TwoRollingEyes or a shot of DoubleFacePalm. How bout a shot of Shades of Grace? Your Twitter TL is a must follow, always timely, challenging, compelling, informative.